Menu found at Beijing restaurant. Lives is addicted, and will soon die from it. They’re planning to base their whole next album on it. – Mommy, who is Kidney Cool? 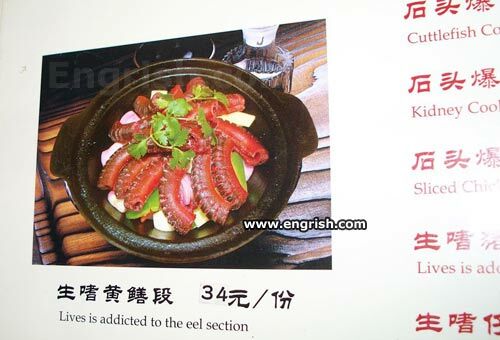 At 34 yuan, it is also addicted to eel section pr0n. He gets a buzz from the electric ones. A nymphomaniac is addicted to the horn section. The bloody eel was running around in the pot like a headless chicken!!! We recommend the many human lives meel: Barbie grill in high heels. In fact, it’s veally good! If you want eels, that’s your business. If you want to quit, that’s our business. To love an electric eel? And borrow anything you cannot steal? I love-a this dish! That’s a-moray! The restaurant keeps playing the song by Human League “Don’t you want me” over and over. C’mon! I’m jonesing real bad, give me some Moray! You must go to the Haddock Rehabeelitation Center. My story is pretty simple. I started out sharing a few longnecks with friends on the weekends. Pretty soon I needed a conger first thing in the morning, just to function. My wife would find the morays I’d hidden around the house. I rather cuddle with the cuttlefish than feel with the eel. A police spokesman said; The suspect was three foot tall, greyish, and very well armed. Brisbane Courier Wail, Jan 21 2014. A young lady who was skinny-dipping was attacked by a six foot eel. A police spokesman said,; ” By the time the lifesavers rescued her, she was completely “done in”. Join the eels! We have cookies!!! It’s time to join Eel-Anon. “Eel Section Addiction” was Captain Beefheart’s proposed followup to 1969’s “Trout Mask Replica”. notice : do not attempt to mate with the Eel , try the octopus instead .